Gemini Forest Products has been working with the Railroad Industry for over 20 years and is one of the largest stocking distributors of Crossties and Switch Ties on the West Coast. 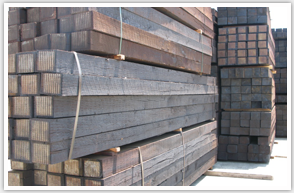 We carry a full line of Creosote treated ties and bridge timbers, as well as, offering end plating services. Our large inventory includes Western Species: Douglas Fir, Hemlock and Hardwoods, as well as, these Southern Species: Southern Yellow Pine and Hardwoods. We offer delivery by truck, UP and BNSF rail. With inventories in Eugene, Oregon and Los Alamitos, California we have the ability to ship to any destination across the Western United States. Gemini Forest has been working with the Railroad Industry for over 20 years, which gives us the knowledge & ability to provide our customers with the most competitive pricing.